Today, we are pleased to announce that Ceramic Resin is now available in North America and Europe. This experimental material for the Form 2 makes 3D printed ceramics accessible outside of expensive industrial machines and high-tech research labs. Using Ceramic Resin, you can 3D print parts with a stone-like finish and fire them to create a fully ceramic piece. Fabricate ceramic parts for engineering research, or create distinctive art and design pieces. Ceramic Resin is a Form X product. This material is more difficult to work with than other Formlabs products and requires extra steps and additional experimentation for successful printing. Make sure to read the Usage Guide (PDF) in full before using this material. When most of us think about ceramics, the first place our mind goes is traditional pottery, but technical ceramics are also used for advanced space-age applications because of their surprising variety of mechanical properties. An entire branch at NASA is devoted to ceramics research, developing materials like Nextel fabric, an advanced ceramic that resists fire penetration and keeps satellites from getting smashed to pieces, and GRABER, a ceramic-filled adhesive used to repair small cracks in space. The military uses ceramic materials to design lightweight armor. High heat resistance and electrical conductivity make alumina ceramics a common choice for electronics components like insulators, resistors, and semiconductors. Fired parts printed in Ceramic Resin have high temperature resistance, high thermal and electrical insulation, high resistance to corrosion and wear, and are chemically inert. Internal R&D and fabrication labs at Fortune 500 companies report high demand for ceramic 3D printing. Today, burgeoning solutions exist, often born from academic research projects, but these solutions are prohibitively expensive, with machines costing upwards of $100,000. With Ceramic Resin, Formlabs is excited to introduce the first affordable ceramic 3D printing material for the world’s industry-leading desktop 3D printer, enabling more engineers and designers to bring rapid iteration with ceramic in-house. 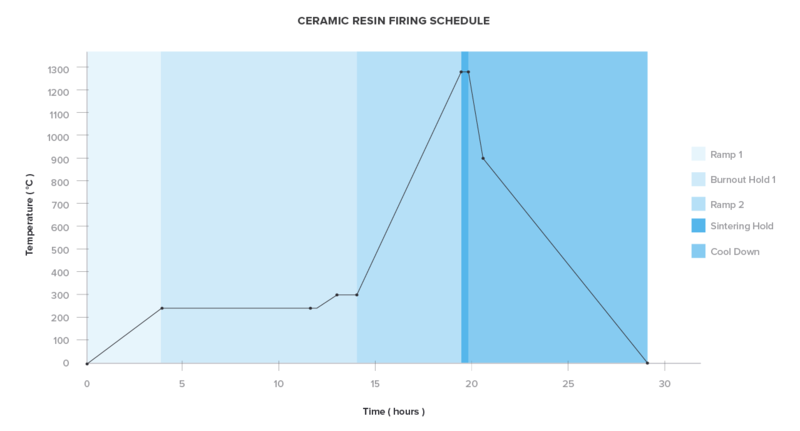 While Ceramic Resin is not considered an advanced technical ceramic, fired parts have unique properties when compared to plastics, like high temperature resistance, high thermal and electrical insulation, high resistance to corrosion and wear, and chemical inertness, that can be leveraged for niche applications where fired part accuracy is not critical. Ceramic Resin is a silica-filled photopolymer. After firing, the photopolymer network burns out to form a true ceramic part. The process is a bit different from other Formlabs materials and requires some additional trial and error. Design. Ceramic Resin requires designing within specific constraints for successful printing and firing. Start small, follow the usage guidelines, and experiment. Prep. Sand your build platform to increase print adherence, shake the cartridge to mix the material, and clear the bite valve. Print. Scale your parts in PreForm to accommodate for expected shrinkage during firing. Send your design to the Form 2 and press print. Post-process. Wash your prints in isopropyl alcohol (IPA) and remove supports (no post-curing necessary). Ensure that parts are completely dry before firing. Fire. Fire your part in an actively ventilated kiln that fires to at least cone 8 to burn out the photopolymer from the material and create a fully ceramic final part. Parts will shrink by around 15% in XY and 29% in Z during firing. Glaze. If desired, apply a glaze of your choosing, following the manufacturer’s instructions. Make sure to read the Ceramic Usage Guide in full before using this material. Parts printed in Ceramic Resin require a 1.5 day firing scheduling in an actively ventilated kiln that fires to at least cone 8. For more details on how to work with Ceramic Resin, read the Usage Guide. If you visited our booth at CES 2017, you may have already seen a preview of Ceramic Resin. After two years of development, Formlabs is excited to ship Ceramic Resin to the next generation of innovators and curious minds ready to take advantage of this cutting-edge material. Ceramic Resin can be used to fabricate small ceramic parts for engineering research for applications where fired part accuracy is not critical. Typically, high end ceramic 3D printers print using highly-filled ceramic pastes. Developing a resin with low enough viscosity that it could print on a system like the Form 2, while maximizing the loading of ceramic particles, was a tough materials challenge. While the final formulation requires more trial and error than non-experimental Formlabs resins, we’re excited to finally release a new material that continues to push what’s possible in-house with desktop stereolithography. Digital artists and designers can use Ceramic Resin to fabricate complex geometries that wouldn’t be possible by hand. 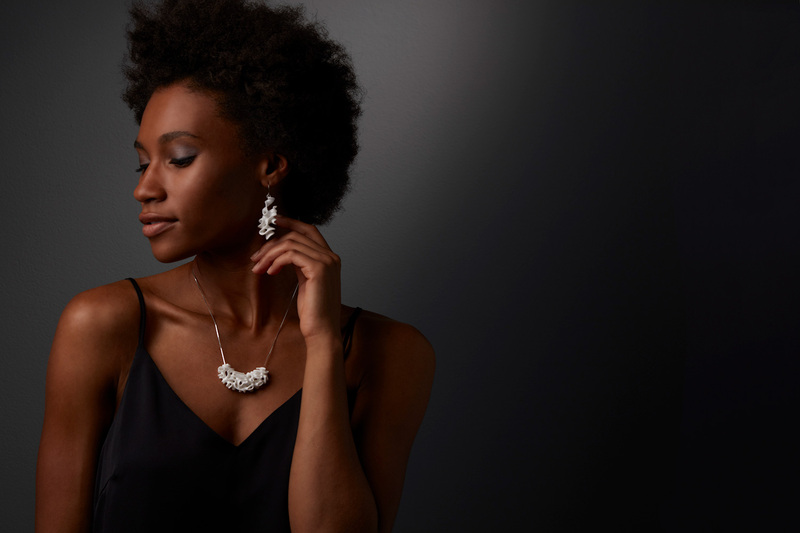 Learn how generative design studio Nervous System developed and launched a 3D printed jewelry line using this new material. Be one of the first to work with a material at the forefront of SLA polymer development. Contact our sales team to discuss whether ceramic is the right fit for your application, or order now if you’re ready to start experimenting. 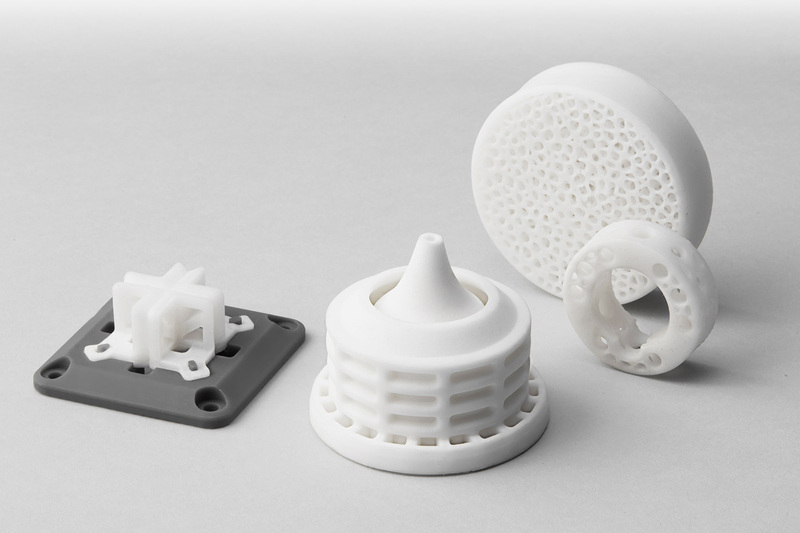 Ceramic Resin is available directly from Formlabs in North America and Europe.